Located near the intersection of E Alondra Blvd and S Main St, Extra Space Storage serves residents of Gardena, West Ranch Dominguez, and Compton. Locals will recognize our facility a few minutes west from Ralph Bunche Elementary School and a few minutes southwest of Enterprise Middle School. Are you a college student looking for a storage unit close campus? Extra Space Storage is about 2.3 miles from California State University Dominguez Hills, so we're a great option for students who need storage over the summer or while studying abroad. Extra Space Storage on E Alondra Blvd offers a wide range of storage unit sizes, climate-controlled storage, vehicle storage, and more, making us your go-to solution in Gardena near West Rancho Dominguez. Our Gardena storage facility has unit sizes from 4x3 storage lockers to large 15x30 units, so we can handle practically any storage need you have! Units also come with convenient features like first-floor access, elevator access, and drive-up access. With security measures like an on-site resident manager, 24-hour video surveillance, and electronic gate access, you can store your items with confidence at our Gardena storage facility! Worried about storing temperature-sensitive items? Keep them safe with climate control! This amenity keeps your unit between 55 and 80° year-round, protecting your belongings from Gardena's heat. Climate-controlled units are available in sizes 5x5 to 10x15. Extra Space Storage provides secure vehicle storage options in Gardena! We can accommodate cars, motorcycles, boats, RVs, and other vehicles with 8x20 outdoor parking spaces and 8x10 to 15x25 enclosed drive-up units. When you choose Extra Space Storage, you can expect high-quality, reliable storage with great service. We maintain a clean, secure facility at all times, and our friendly, professional team will go the extra mile to provide assistance when you need it. 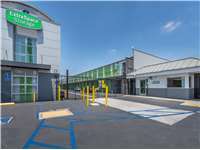 Contact us today to reserve a storage unit in Gardena! This facility is very clean and the customer service is great! My initial experience with an Extra Storage employee was very positive, great customer service. Emma helped me find a storage unit that was fit for my needs. She took the time to show me all the available units and thoroughly answered all my questions. She was by far the best worker at this facility. I would highly recommend this location. Moving is a very stressful situation. Thankfully, the storage part of my move was a pleasure thanks to the awesome staff - Emma Ash and Lisa Jacob. They were very helpful in finding a storage unit that filled my needs. The facility is clean and the prices are fair. I only wish that the storage hours were past 8pm. This place is always clean the staff is friendly and helpful! I had no problem renting a space from extra space storage. People were very nice and they helped me with the size of the space that I needed. Good job!!! This facility is very clean and I like that. Also the hours are convinient, employees are extremely helpful. The size of the storage and all the units are fantastic. Could use more carts but overall I'm happy to store my most valued items at this extra space storage. Its just great doing business with this facility. I never have any problems when I go. i found this facility to plasent and the employees very helpful in resolving issues. This facility is also easily accessable from my house. I've been with this facility on and off for a few years now, and I have never had a problem with anything. Overall customer service is good. The staff is knowledable and helpful with explaining all the contract documents. Facility is clean and has moving carts readily available for use. Additional security code required to access 2nd story units via an elevator. Great friendly staff! Great prices...super clean.They have excellent service great hours. When my payment is due get reminder calls and email. This facility has easy access, great hours. It's convenient and it's super clean, Great staff. the phone is never answered, they do not return phone calls and the manager is rude and unwilling to help. This storage is very convient between my Job and house. This facility is always clean. I've never had anything every stolen and I've been here since 2005. The customer service here is great. Ive rented from two different extra space facilities, and both of them are nice, clean and the staff are really helpful. I havent had any problems with them. Staff are always ready to help you. I have great experience with this the staff of this storage . Thank you ! Excellent customer service, drive up access units our great very clean facilty! Its ok. I just think that management was not to good. Traveling North on the 110 fwy, take the Redondo Beach Blvd offramp, making a left off of the freeway. Make a right at Main Street and then a left onto Alondra Blvd, passing Jamie's Deli on the right. The facility is located on the left hand side of the road and a "U" turn will be required and our parking lot is the second drive way on the right. Traveling South on the 110 fwy, take the Redondo Beach Blvd offramp, making a left off of the freeway. Make a right at Main Street and then a left onto Alondra Blvd, passing Jamie's Deli on the right. The facility is located on the left hand side of the road and a "U" turn will be required and our parking lot is the second drive way on the right. Traveling West on the 91 Frwy take the Avalon offramp making a right hand turn at end of ramp. Proceed up Avalon Blvd for just over one mile, making a left hand turn onto Alondra Blvd, passing Tom's Burgers on the right hand corner. Continue for another 1/2 mile and the facility is located on your right hand side just past Sparkletts Water. Traveling East on the 91 Frwy take the Avalon offramp making a left hand turn. Proceed up Avalon Blvd for just over one mile, making a left hand turn onto Alondra Blvd, passing Tom's Burgers on the right hand corner. Continue for another 1/2 mile and the facility is located on your right hand side just past Sparkletts Water.